Picture a fairly idyllic setting with a thatched hut, some pheasants and chickens pecking about by the hut, some large trees, rolling lush mounds, some farmers hard at work in the background, a butterfly or two flitting about, while a grandmother gently yet firmly urges her granddaughter to "Pull back hard... Make it jolt, so the thread stays close, like family." She is kneeling in front of a backstrap loom willingly passing on her weaving acumen to her granddaughter, Esperanza. 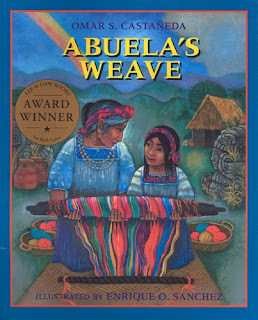 Abuela's Weave shows a snippet, a tranche de la vie (slice of life) picture, in the life of young Esperanza in rural Santa Cruz, Guatemala. The gently flowing narrative intertwines rich vignettes of the landscape and culture with the tacit tale of bonding between a grandmother and her granddaughter, their lives woven together with hopes, dreams and love. Grandma (Abuela, in Spanish) is nervous about selling her hand-made, one-of-a-kind huipiles (blouses), tablecoths, skirts and tapestries at the Fiesta de Pueblos in Guate, especially when mass-produced machine-made goods were attracting the shoppers with their low price. Esperanza pushes aside negative thoughts and works hard, glad that her Abuela is next to her, teaching and encouraging her to weave her best. Together they focus on the job at hand, setting aside intergenerational differences, anxiously getting ready for the fiesta. The day arrives, bright with sunshine after the night's rain. Esperanza wears her favorite huipil: white blouse with red, blue and green threads in rectangular collar, and loads her straw basket with the hand-made weaves she and her Abuela have worked on diligently and gets ready for the journey to the market. As she struggles to fight off the butterflies in her stomach, Esperanza notices that Abuela is disguised as a woman in mourning, dressed in black, covered from head to toe with only her eyes visible to the world. Trusting Abuela's reasons for her strange appearance, Esperanza makes her way down the dirt avenue to board the bus to get to the city. She notices that Abuela is walking a few paces behind, pretending not to know her at all, determined to travel separately. Before she could ask, Abuela settles Esperanza's concerned look explaining, "This way if my birthmark frightens customers, they will still buy from you", for Abuela is afraid that the birthmark on her cheek will frighten customers away, branding her a witch. Esperanza is bombarded with mixed emotions as she makes her way to the Parque Central in the city, her lungs aching from automobile and bus fumes, her ears ringing with screeching brakes, horns and shouts. She tries to ignore the commotion and walks steadily towards where the stalls are being set up for the fiesta, trying not to look back to catch sight of her Abuela. By the time she arrives, the stalls are full, and everybody is busy setting up their wares that they ignore her requests for help. She finally manages to find a spot between the narrow slats of two stalls, puts down her basket and starts hanging up her weaves. On one side, a family from Antigua is set up to sell pottery, reproductions of Mayan crafts and clothes loomed in one of the many factories. On the other side, a woman is selling bolts of cloth, musical instruments and decorative bags; bags with zippers machined in the capital and long handles of colorful plastic. Momentarily, Esperanza feels defeated. She fears no one will buy anything from her as everything else around looks so beautiful... she would return home with no money, long hours wasted, and leave the family disappointed. She is almost on the verge of tears and her dear Abuelita is nowhere to be seen. She busies herself with setting up shop and when done she nervously looks around with just a glimmer of hope. Slowly, people notice. They point awestruck at the elaborate weaving. Tourists and Guatemalans alike flock to her little place, turning away from the commercial stalls. Needless to say, it doesn't take long for all of their work to be sold, with Esperanza and her Abuela promising to return next month with new things. I couldn't help contrast my own childhood and my daughter's in relation to Esperanza's. Initiated into becoming an artisan weaver at her tender age, a Mayan tradition passed down from generation to generation, Esperanza's initial apprehensions lead to growing confidence and eventually results in pride at a job well done when she manages to sell all her weaves at the fiesta. I began to wonder what exactly will I be passing down to my daughter... but, I'll save that thought for another day. The acrylic on canvas illustrations by Sanchez are lush and radiant, zooming in on the rapport between the grandmother and granddaughter at times, and panning out to showcase the rural landscape and the crowded cityscape. The full-page and double-page illustrations that closely complement the narration portray the rite of initiation for a young girl under the watchful eye of her grandmother, making this book a treasure. Also, this story brings to mind one by Tulika called 'Hina in the Old City' by Sameena Mishra - its about a 10 yr old girl whose family earns their living through zardosi embroidery. Reminded of a book by tara publications about folk tales from africa where a grandma(a weaver?) relates stories to her grandson. Wow Sheela! Your words were a graphic experience for me, as I went to the market, set up stall and felt those butterflies in my stomach. Such a tender book. A warm story indeed. I am sure the colorful spreads were a treat! Good one Sheela. A touching Guatemalan story...hmmm...lovely, Sheela! 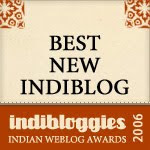 How beautifully you've woven the words together - reading the review was like walking through a street filled with shops displaying elegant and colorful arrays of tapestries. this was lovely, Sheela. your pick -and your beautiful, weaving narration of the tale. Can't wait to see the 'weaves' myself! Sheela, what you said about the different lifestyles of children from different backgrounds, strikes a chord with me. My father is from a weaving family and he was the first generation of kids to come out of weaving and get his doctorate and work as a chemistry professor. He retired as the head of the chem dept of Presidency College, Madras. Now he is still working as the Dean of science at MGR university. My father had to go to a hostel from age 5(the only was he could get free education and boarding and all his text books, uniform, clothes etc taken care of) and could visit his parents twice a year(at age 5, he had to save for 6 months to make one trip home that was basically 30 miles or so)....he established for himself a better life style than my grandfather and has created a cushy life style for me. Now, I am just rambling, it just stirred a lot of mixed emotions in me. Also very true about unique mom and pop outfits suffering because of the 'chains' and the big guys. I second Boo - it's high time you wrote a children's book yourself - Sheela - full of art and craft surprises - I can just imagine it!